Free copies of the full report (497 pp) and the highlights version (98 pp) are available in PDF format via the links I provided in this sentence. An on-line summary is available here too, with links to country notes for Brazil (in English; in Portuguese, Chile, Estonia, France (in French), Germany (in English; in German), Greece, Italy (in English; in Italian), Japan (in English, in Japanese), Korea, Mexico (in English; in Spanish), Spain (in English; in Spanish), and the United Kingdom. 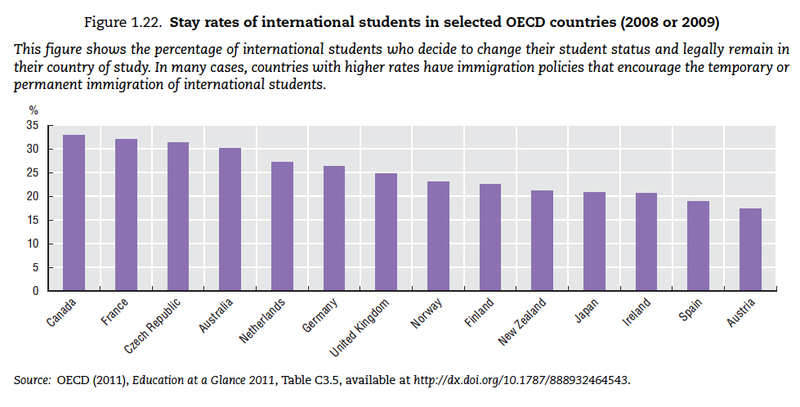 While all of the sections are worth reading, I always find the data regarding international student mobility too hard to resist glancing at when the report first comes out. These six graphics, and associated highlights (all but the first extracted from the highlights version of Education at a Glance 2011) will give you a flavour of some of the noteworthy student mobility trends. Further details regarding mobility trends and patterns can be found in the full report (pp. 318-339). In 2009, almost 3.7 million tertiary students were enrolled outside their country of citizenship, representing an increase of more than 6% on the previous year. Just over 77% of students worldwide who study abroad do so in OECD countries. In absolute terms, the largest numbers of international students are from China, India and Korea. Asians account for 52% of all students studying abroad worldwide. Where do students go to study abroad? Six countries – Australia, Canada, France, Germany, the United Kingdom and the United States – hosted more than half of the world’s students who studied abroad in 2009. 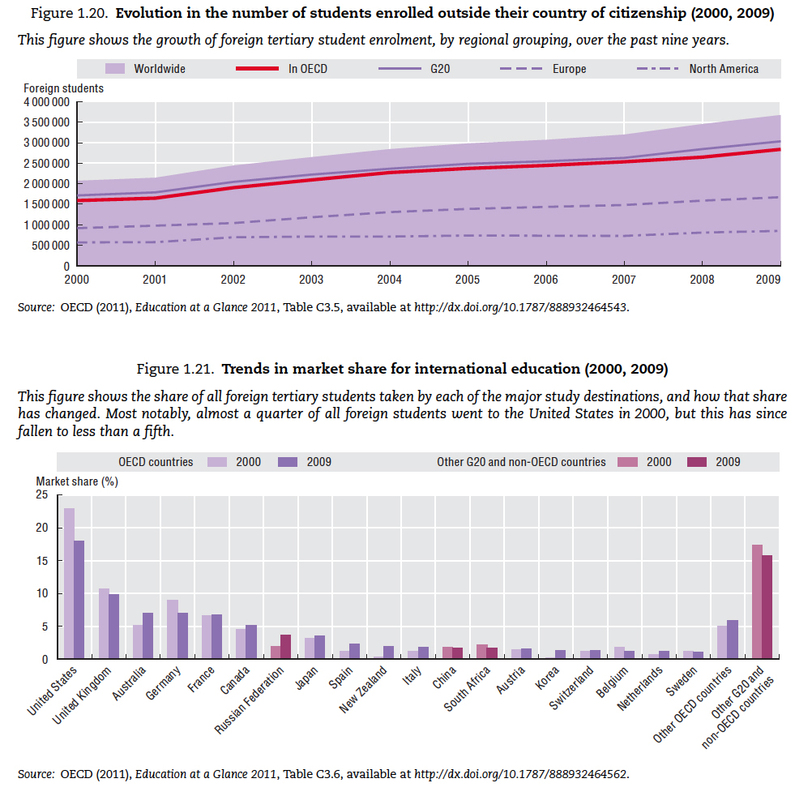 The United States saw a significant drop as a preferred destination of foreign students between 2000 and 2009, falling from about 23% of the global market share to 18%. The shares of foreign students who chose Australia and New Zealand as their destination grew by almost 2%, as did that in the Russian Federation, which has become an important new player on the international education market. How many international students stay on in the host country? Several OECD countries have eased their immigration policies to encourage the temporary or permanent immigration of international students, including Australia, Canada, Finland, France, New Zealand and Norway. Many students move under a free-movement regime, such as the European Union, and do not need a residence permit to remain in their country of study. On average, 25% of international students who did not renew their student permits changed their student status in the host country mainly for work-related reasons. Obst, D., Kuder, M., and Banks, C. (2011) Joint and Double Degree Programs in the Global Context: Report on an International Survey, IIE and the Freie Universität Berlin, September. Canadian Education Statistics Council (2011) Education Indicators in Canada: An International Perspective 2011, Statistics Canada and CMEC, September. Green, M., and Ferguson, A. 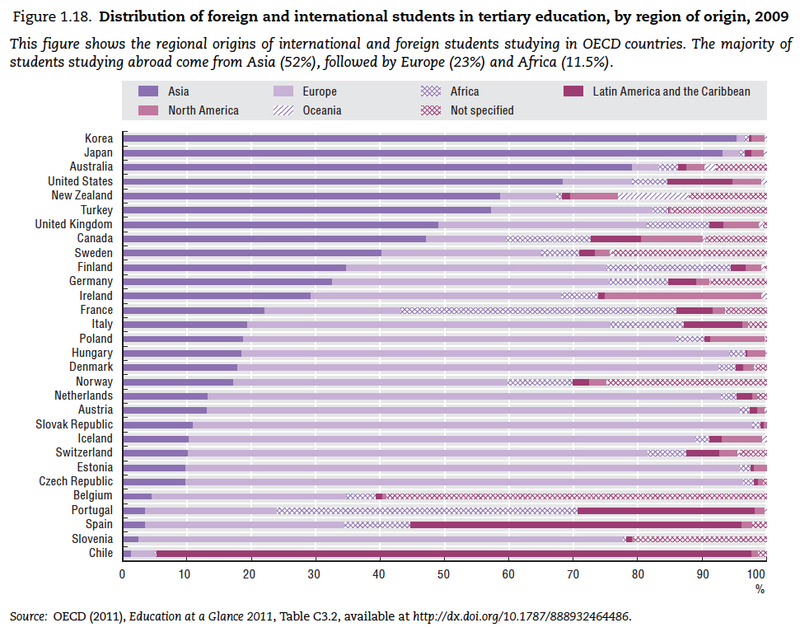 (2011) Internationalization of US Higher Education in a Time of Declining Resources, Australian Education International, June. The reworking of the global higher education landscape continues to generate a wide array of ripple effects at a range of scales (from the local through to the global). While not perfect, the OECD’s annual Education at a Glance 2011 does an excellent job providing much of the available data on these trends, and on a wide array of issues and phenomenon that help to shape these mobility outcomes. A comparative perspective, after all, helps to flag the place of individual countries’ in the broader and ever evolving landscape; a landscape that countries play a significant role in both constructing, and reacting to. 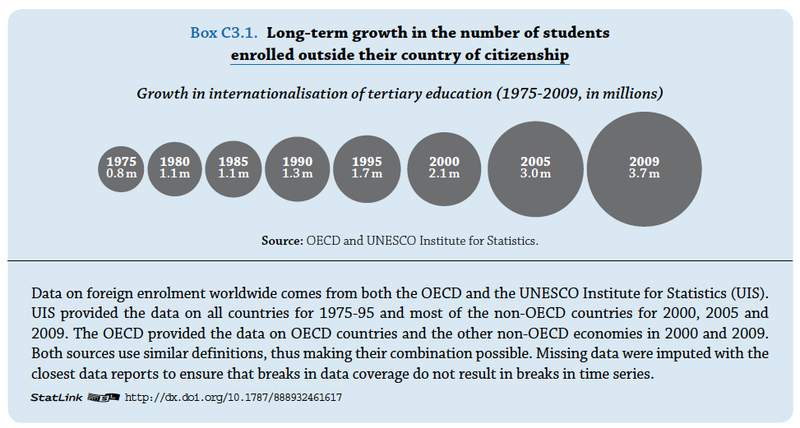 This entry was posted in internationalization, OECD, Student mobility and tagged Education at a Glance 2011, Foreign Students, international students, OECD. Bookmark the permalink. Thanks for the summary Kris. I too look forward to the mobility data with each new report but things are quite a bit crazy with my schedule and I won’t have time to peruse anytime soon so your summary is much appreciated! For this article, I would like to comment that I find it interesting that the US has decreased its market share in study abroad students choosing the US as a destination and that the alternative choice is Australia, New Zealand, and the Russian Federation. 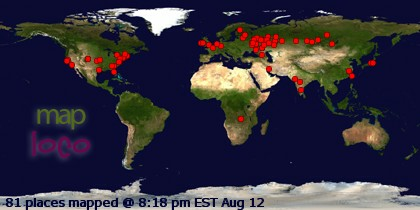 Anyone have any idea as to why this is trend? Which is the most popular academic area students study abroad? Why do you think that study abroad has increased and seem to continue to increase? Do you see study abroad as a threat to US higher educational institutions? You commented “The United States saw a significant drop as a preferred destination of foreign students between 2000 and 2009, falling from about 23% of the global market share to 18%.” Is there a reason for this? Is it linked to the education, visas, or living arrangements? Could costs, scholarships or other reasons be at the root of this? I’d also like to understand the reasoning behind the trends of studying abroad. Is the mere fact that people are attracted to “getting away” or the romantic idea of saying they studied in a another country a factor at all? Or are there things U.S. institutions could improve to change those totals? Thank you for your post. I find the effects of studying abroad on the United States and the higher education system interesting. What are your thoughts as to why Canada and the United Kingdom have come to be more appealing to students than the United States? I would appreciate your feedback! With the decline in the U.S. from 23% to 18%, as the destination for international students, how does that impact the perception of the international community, on the overall quality of American higher education?